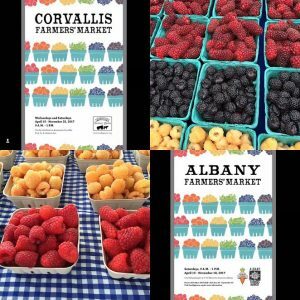 “Corvallis-Albany Farmers’ Markets, just 10 miles apart, are the destinations for farmers within a six-county area in the center of Oregon’s Willamette Valley, a spectacular growing region defined by two mountain ranges and soils bourne of the Missoula Floods at the end of the last Ice Age,” says Vonda Peters, a CAFM market coordinator. Albany is more a tourist destination, having three historic districts with dabbles of Victorian residentials, as well as commercial and industrial areas. Ten miles off the freeway sits Corvallis, a college town (OSU) that is fairly quiet but gets visits from out-of-towners showing up for academic conferences and sporting events. Rebecca Landis, CAFM Market Director, explains jokingly, “Because OSU is a land grant institution, Corvallis has a number of residents who have academic interest in agriculture. If you’re having a conversation about an agricultural crop or wild mushrooms, you might find an expert in whatever you are discussing standing behind you, ready to chime in with extra information.” Regardless of what brings them there, market-goers are sure to find that Corvallis and Albany add much flavor to their community scene. 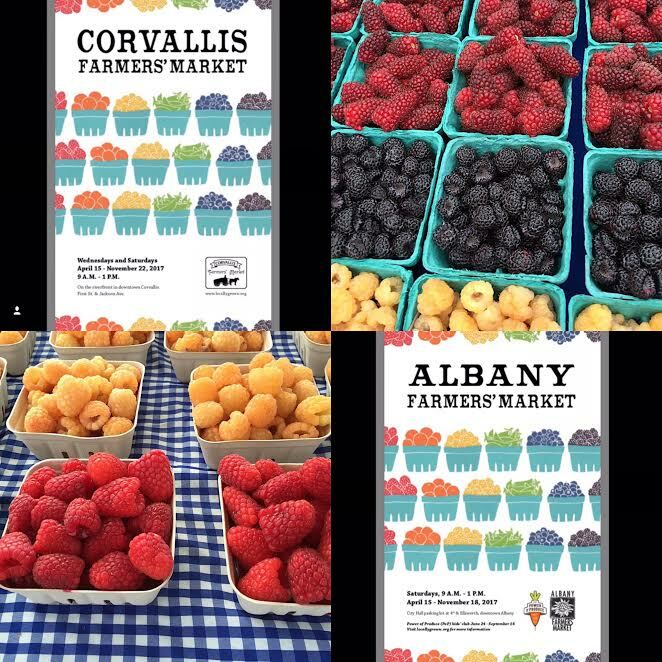 Follow along as the Corvallis-Albany Farmers’ Markets takeover our Instagram. Vonda Peters: CAFM operates two Saturday farmers’ markets and one Wednesday farmers’ market in two communities that are 10 miles apart. We are somewhat unusual in that we run all three markets for 32 weeks instead of offering a shorter run for the mid-week market. The two smaller markets have about 30 vendors at peak season, and the largest has now topped 70 vendors at times. The averages are 53 vendors per market for the largest and 22 vendors per market for the smaller markets. We operate with a small staff of one more-than-full-time market director and a variety of specialized part-time positions. Most of our volunteer effort is found in the community event booths we offer on most market days. Partners are largely from the nonprofit world and our land grant institution, Oregon State University. We focus on food and nutrition, gardening, agriculture, human and animal health, art, history, reading soil and water conservation/quality, and other science relevant to the natural world. Our guidelines focus our markets almost exclusively on farm-direct agriculture, with a few restaurants and baked goods to keep our customers from fleeing due to acute hunger pangs brought on by our glorious displays. These markets are run by a nonprofit association whose members are the farmers. VP: CAFM provides space at each market for events, activities and music. We offer space to primarily non profits with a focus on health, nutrition, gardening, agriculture, art, education, and local events. We benefit from our proximity to OSU. OSU Pharmacy provides health screenings twice a year at our Saturday markets. We also have worked with science departments, music groups, and OSU Athletics (athletes partner with our local bookmobile during the mid season) for events at our Corvallis site. OSU Master Gardeners staff booths at all three markets, twice a month. Master Food Preservers are present at all three markets once a month. Amongst our Albany market events is the traditional customer appreciation ice cream sundae sample day each year on the market closest to the 4th of July — with beautiful red and blue berries served over Lochmead ice cream and a sprinkle of local hazelnuts. Our newest excitement at the Albany market is the addition of POP (Power of Produce) Club. We registered 500 children in 2016 (1st year) and we are expanding the program to run 13 weeks this year (basically summer break, June 17 – Sept 9). We love cooking demos and samplings and add them whenever possible. Most interactive booths provide something for children, but often adults take part as well. We have provided space for some wonderful community art projects in Corvallis. VP: Although our farmers’ markets were the lab rats for Oregon State University’s now internationally acclaimed market assessment methods, we believe there is no feasible way to learn what really works. Survey respondents pick “Word of Mouth,” but that has to come from somewhere. So like other markets, we deploy a number of strategies and hope for the best. If there is a common thread in our successful communications, it is probably colorful photos. We do the “Big Three” of social media (Facebook, Instagram, Twitter), some radio, and some newspaper. Newspaper circulation continues to decline, and we didn’t notice any harm when we dropped much of it last year. (This year we might do a bit of print for opening and then stop again.) We have no permanent site signs. We use colorful bookmarks in place of standard brochures or rack cards. Two bookmarks fit side by side in a rack. VP: There is sometimes an unfair comparison drawn between our markets in the two communities. We hear verbal hand-wringing over the difference in size. Both markets have high-quality products and vendors, and size is not the only way to measure value of markets.The smaller market has continued to improve a little each year, and we feel we are making even more progress now by running a Power of Produce program (POP Club) there. FMC: What is an area that the markets are focused on? VP: We try hard to make our markets accessible to the whole community, not just its most financially secure members. Even communities that look relatively well-off have people who are struggling with trade-offs among costs of housing, food, and medical care. So we spend a lot of energy on SNAP, nutrition incentives, and other local food system goals.